The Nata Vega Outlet is a shopping mall constructed between 2008-10 as part of a large mixed-use development in the hills to the south east of Ankara. 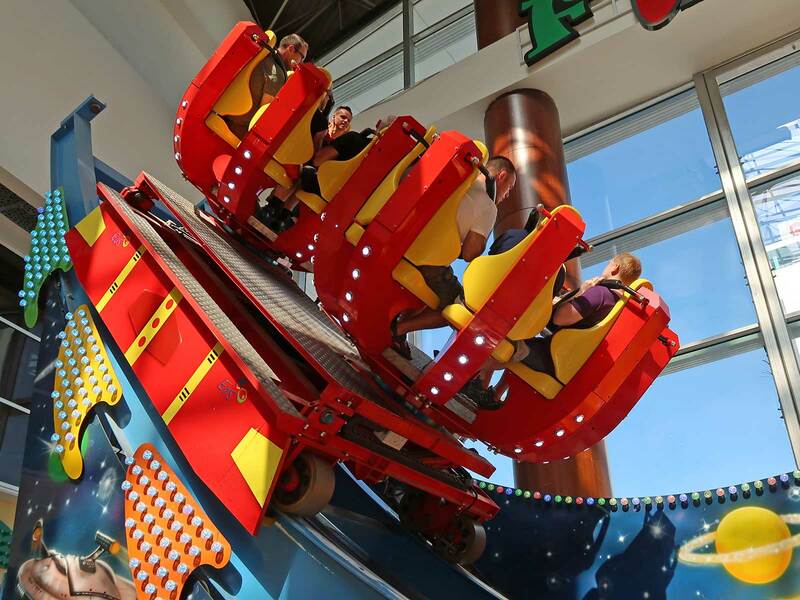 The site includes two residential tower blocks, an aquarium, a fourteen screen cinema, several car dealers, and Fun Land, a substantial family entertainment centre with a good selection of rides. The vast majority appeared to be Italian imports, though this fact was being disguised; today all the larger machines were adorned with Turkish flags. We began our visit with Grand Prix (#2517), currently the only known installation of the IE Park JR 40. The layout is unique, bearing no resemblance to either the smaller or the larger rides in the product line, though it must be said that it doesn't do all that much; as with the coaster on Monday the design is very much in family coaster territory with a maximum speed of just forty kilometres per hour, considerably lower than its twelve metre height would ordinarily enable. The train features unnecessary over-the-shoulder restraints, though they have no impact on the ride quality which was smooth throughout in the both the middle and the back of the train (the front was out of service today). The only caveat is that they are not designed for larger riders; at least one member of our group ended up doing the walk of shame despite our best efforts to help. Our third stop was at the Haunted Castle, a dark ride with a dramatic portrayal of the grim reaper mounted high above its entrance. The cars moved at a decent speed, but there was almost nothing to see; the journey consisted of long sections of blackness that presumably featured horrors at some point in the past. I'm told that there were a grand total of three working effects along the route, though the only one that I remembered came right at the end: an animatronic with a green face holding a severed female head by the hair. Moments later we broke back into daylight bemoaning the loss of several valuable minutes of our lives that we would never get back. We had more credits available than we knew what to do with and decided to blow a bunch of them on Desperados, a standard version of the game and the first I've come across in quite a while. The calibration on my gun was off by about six inches, but fortunately there was a clear indicator on the display indicating where my shots were landing, allowing me to adjust my aim. It was interesting to see the theatre screened off by a curtain rather than a wall, presumably as a cost saving measure; fortunately the volume level was high enough that the background noise from the mall wasn't noticeable. With that done we wrapped our visit with a ride on an unnamed rotating tower ride with a lengthy programme that included numerous forceful full height drops. Harikalar Diyari (Wonderland) is a two hundred acre urban park located in the north west corner of Ankara. It has a wide range of facilities, including artificial turf pitches, go-karts, basketball and tennis courts, skateboard tracks, and an amphitheater with a seating capacity of five thousand people located right next to a dedicated metro station. 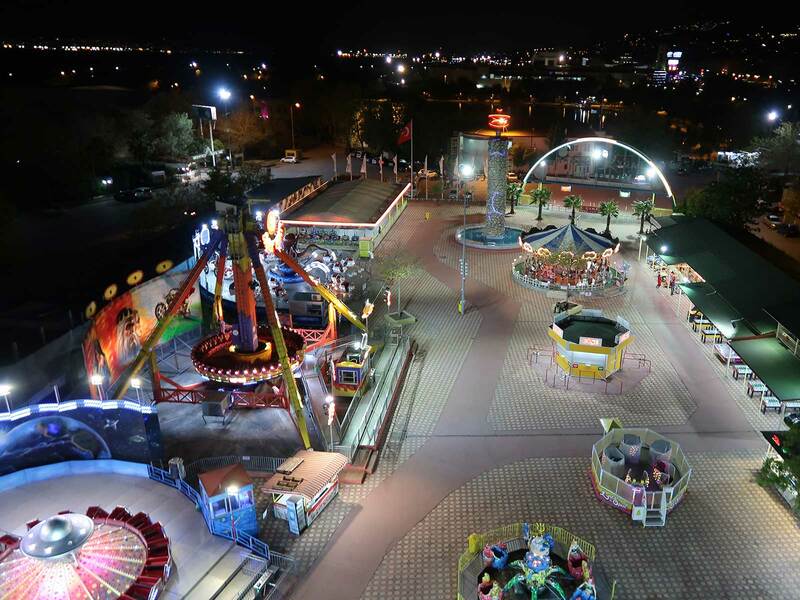 One tiny corner of the site, some five acres, is home to Sincan Luna Park, an eclectic mix of rides and attractions. There were two operational roller coasters present today, with parts for a third piled up in a corner; a staff member told me in broken English that they had been bought from a park in Mersin and would be assembled over the winter months. Other major attractions include two identical Discovery Atlas giant frisbees, an unpainted Log Flume, a Fabbri Booster, and a full size Giant Drop. Elma Kurdu (#2518) is an elderly Wacky Worm that is very clearly approaching the end of its service life. As with most rides of the type the train can seat twenty-four passengers, but today the operators were allowing a maximum of six on board at a time, all of whom had to sit towards the front. The first group on board warned the rest of us to duck inside the apple, and this advice was more than a little pertinent; it turned out that one of the support beams holding up the structure had buckled, leaving it just inches clear of the top of my head. The low speed of the train at that point meant that it wasn't as dangerous as it might have been, but even still the ride would never pass a safety inspection in a western country. We were rather more taken with Dragon, a Zamperla powered coaster that looked equally decrepit at first glance. Against all expectations however the experience was among the best I've had on this style of ride, as the motor power had been set to an unusually high level. Our ten laps were memorable for exceptionally strong lateral forces, reminding me very much of the machine at Lagolandia (which I'd assumed to be a isolated example). I found myself wondering whether any of the other extant models are hidden gems, or if the top speed is adjustable by a park, opening up interesting opportunities for a future club ERS. Answers on a postcard please. The park has an imaginatively named and mostly pointless SBF Dark Ride that spans three levels. The first scene just inside the entrance is an air compressor, and things don't get much better from there. A chain lift up to the second floor leads to an outside section with no effects, a sequence repeated with the climb up to the third floor. It is only back inside when a corpse sits up in a coffin and a variety of different sound effects play. Much of the rest was forgettable, though it'd be remiss of me not to mention the final scene where the cars pass under three ceiling mounted brooms. My first thought was that the designers were trying to frighten those terrified of clean floors, but perhaps it was an attempt to sweep the cobwebs away? We had hoped to pick up some food with a lengthy drive ahead of us, but there were absolutely no options available. Given that Megan and I decided to burn our remaining time with a lap on the Ferris Wheel. The ride had square cabins that had been themed to look like classic American cars, complete with headlights and radiator grilles. It is a five hour drive from Ankara to Istanbul, and the club decided to break it with a stop at Park Lunasan, a small park in the resort town of Izmit. We learned on arrival that the smaller of the two roller coasters was officially closed for the season, but that park management had agreed to find someone to start it up for the fifty plus enthusiasts in their midst. This was wonderful news and something we'd never have achieved had we been travelling independently. The first task was to tick off Twister Coaster (#2519), and the word "tick" was definitely the right way to describe a thoroughly lacklustre ride. My car managed just one revolution on our way around the course, and it was obvious from the ground that other club members were doing little better. Though we had plenty of credit on our smart cards the majority of us decided against going back for a second lap and headed instead to Körfez Güneşi (Gulf Sun), a forty-five metre Ferris wheel located right in the center of the park and perfectly placed for an overview shot. (Readers visiting the park during daylight hours may also be able to spot the Sea of Marmara, located less than a kilometre away). Once back at ground level we climbed over an improvised barrier into the closed section of the park, where our group had congregated in front of Spinning Coaster (#2520), remarkably enough the first figure eight spinning coaster of the trip. There was something particularly entertaining about a large group enjoying such a pathetic ride together. I've now experienced the genre in sixteen countries, and before anyone judges me for that sentence I challenge you to think of something interesting different to say after you've ridden over two dozen versions of such a simple design. They're multiplying, too; as of this writing RCDB lists eleven new versions of the "two loop" design in 2018, and one suspects there are more out there that have yet to be discovered. Who will be the first enthusiast to tick off the recently discovered version in Trinidad and Tobago? 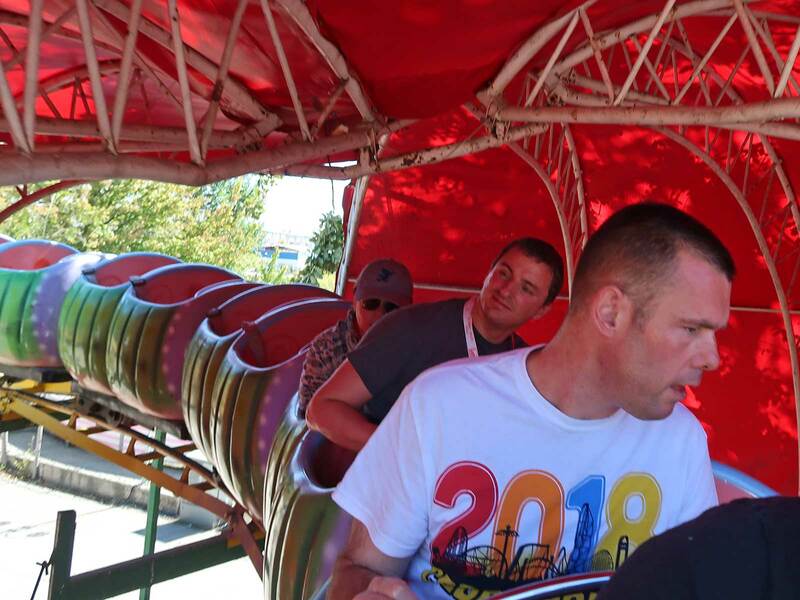 We were essentially done at this point when the word began to spread that the operators on Twister Coaster had decided to "pull the pin" on their spinning coaster cars. This simple action transformed what had been a dull tick into an extreme thrill that was well up there with the most intense coaster rides I've ever experienced. Our carefully balanced car with three passengers in it began spinning at the top of the lift hill, and it only got faster, to the point that we were holding on for dear life by the time we reached the base of the main drop. The remainder of the layout was quite literally a blur; the forces were too strong to see much of anything. The sensations reminded me very much of the manually boosted waltzer rides found in the UK and Ireland; we managed six full revolutions in the brake run before an operator brought us to a stop. We had a second pin out circuit that wasn't quite as exciting as the first, though still highly enjoyable; if all spinning mice did that they'd be far better rides. One suspects that will never happen due to increased maintenance costs (not to mention the elevated chance of protein spillages) but an enthusiast can dream.